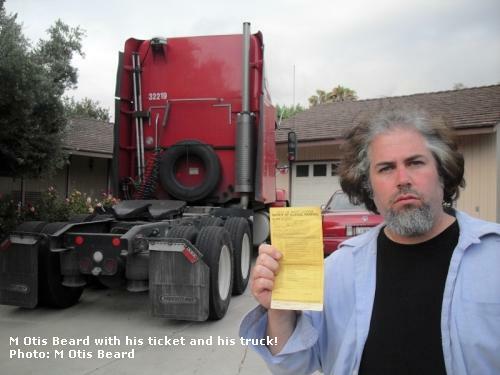 [HollywoodInvestigator.com] This morning I found parking ticket #204863 issued by officer Duran (serial #779) affixed to the window of my vehicle, which is the tractor portion of a "big rig" tractor-trailer. The fine is $210. This vehicle was parked in the driveway of my home, the house that my family and I own. 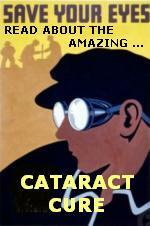 The vehicle is not an eyesore. It is not left running and does not make any noise that might disturb the neighbors. Thanks to the trees and foliage in my front yard, the neighbors can't see it unless they make a real effort, or go out into the street. We live at the end of a cul-de-sac, not on a street with heavy passing traffic. The vehicle doesn't leak oil or other fluids, and does not represent any environmental impact on the neighborhood. Officer Duran didn't even give me the courtesy of a knock-and-talk before ticketing my vehicle. He snuck in and left his citation, with its accompanying enormous fine. How dare the city of West Covina fine me for parking my vehicle unobtrusively on my own property! What's next? Are you going to come into my house and fine me for mounting my toilet paper roll in an unapproved direction? If you are worried about some kind of theoretical negative impact that the vehicle might make (noise, leaking fluids, presenting an eyesore because the vehicle is damaged or run-down, etc.) then pass a law against the specific negative impact. But don't tell me I can't park my vehicle on my property when it presents no negative impact! Truckers are part of this community too, and we need to be accommodated. You have already passed laws forbidding us from parking our vehicles on city property, or on commercial lots, like that belonging to the local mall. Fine, I can live with that. 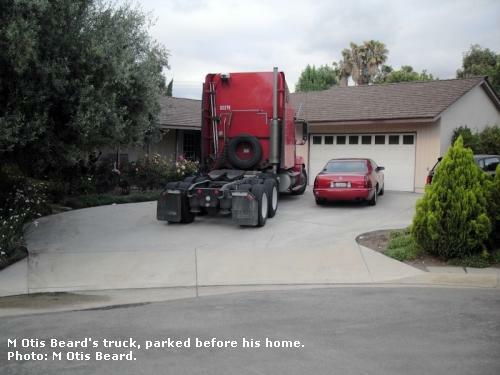 But when you tell me I can't park my vehicle on my own driveway despite that it interferes with nobody, does nothing to decrease the beauty of the neighborhood or the property values of the houses, and generates no noise, damage, or environmental impact, then you are way out of line. Even if I wasn't outraged by the high-handedness with which you dictate to me the uses of my own property, vis a vis what vehicles I can and can't park there, you have created a situation in which I have to park in another city altogether whenever I want to take a break from work, and spend a few days at home with my family. What do you expect me to do? Park in Ontario and walk home? I spend six weeks at a time on the road. I deserve to come home and park my vehicle on my own property without having to worry about some cop coming along and slapping a ticket on my windshield that will cost me more than an entire day's pay. Banning trucks from one city causes a higher concentration of trucks in surrounding cities. What am I supposed to do when this practice prompts all the neighboring areas to pass similar bans in the face of the burgeoning number of trucks parked there, driven out of West Covina and other truck-banning municipalities by a law that denies the citizenry their right to use their own property as they see fit? Shall I park in Arizona and hitchhike home to see my family? If it wasn't for big rigs, you and your families would be forced to use only locally produced goods. The clothes on your back would be drab, undyed, unfashionable rags. You'd spend a great deal of your time scratching in the dirt of your backyard merely for sustenance. Your diet would lack the variety you have enjoyed your entire lives and now take for granted. Considering the dire predicament that Southern California regularly gets into regarding shortages in the water supply, attempts to grow enough food locally to feed the entire local population would result in mass starvation. This is what big rigs, and the men and women who drive them, save you from. In return, you treat us like pariahs, pass legislation that makes us unwelcome wherever we go -- unless we're making a delivery! -- and deny us the right of parking our tractors on our own driveways. I will not pay this ticket, plain and simple. I expect an answer from you people regarding this matter. If one is not forthcoming, you will see me in person on the steps of City Hall, at the next City Council meeting, in the Mayor's office -- wherever it takes -- until this matter is resolved. If I have to go to jail to see this thing through, then so be it. 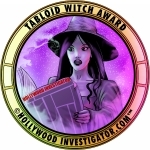 If I have to hound every journalist from every local newspaper and TV station in Los Angeles County to get coverage, I will. Your laws regarding commercial vehicles are unfair, obtrusive, and discriminatory. This shall not stand while I have breath in my body. 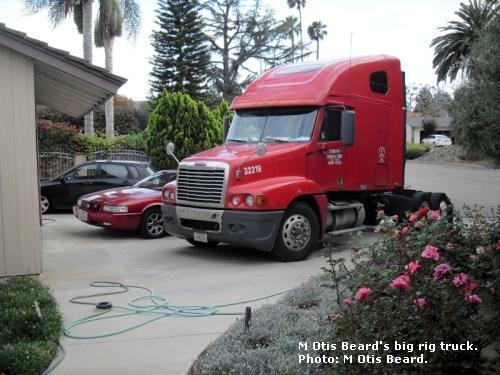 M Otis Beard is a trucker who resides in West Covina, CA. The above is adapted from an email he'd sent to the Mayor and several City Council members on June 7, 2009. He awaits their response. Mr. Beard's email: atomdebris@gmail.com.